Shopping for a 3 carat diamond engagement ring? Learn how much you can expect to pay and smart tips you need to know to get the best diamond for the money. A 3 carat diamond is the ultimate showstopper. And as long as you know what you're doing when buying one, you can end up with a diamond truly the center of attention in any room. That's where we can help. We're going to show you how to get the best 3 carat diamond for your budget. Consider reputable online retailers like Blue Nile and James Allen. These stores offer high-quality images and videos of their gems so shoppers know what they're getting. How Big is a 3 Carat Diamond? How Much Does a 3 Carat Diamond Cost? Where is the Best Place to Buy a 3 Carat Diamond Ring? Round and asscher cuts tend to look the smallest. Elongated shapes like oval, marquise, pear, and emerald cuts are known for appearing larger. Tip: A 3-carat diamond is meant to be a statement piece. So it's best to show it off in a simple solitaire setting. This allows the stone to be the center of attention without any other distractions. The price per carat increases exponentially. A 3-carat diamond is not simply three times the price of a 1-carat diamond. It's more like 10 times the price. This is because it's extremely rare to find a piece of rough material good enough to be cut into a 3-carat diamond. If you're deciding between a 2 carat or 3 carat stone, check out our guide for 2 carat diamond ring. A 3-carat stone can cost anywhere between $20,000 to $240,000. The price depends on the quality of the stone. Flawless and colorless 3-carat diamonds will cost many times more than diamonds with visible flaws and a yellow tint. 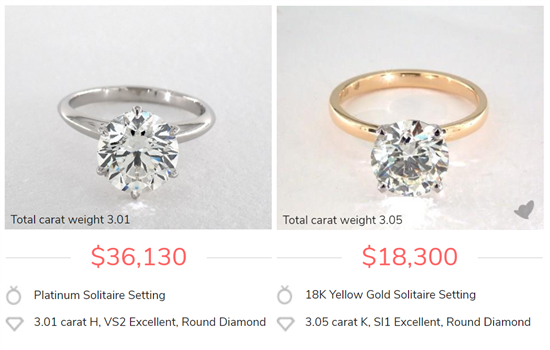 The colorless, almost flawless diamond on the left costs close to 6 figures. But you don't need to spend anywhere near that to get a beautiful 3-carat diamond. The diamond on the right represents a good balance. We recommend ideal cut, VS2 clarity, and color H for a sparkling, eye-clean, white looking diamond. It's unlikely that anyone will be able to tell the difference. Did you know? Only about 1 out of every 7 million diamonds are completely flawless and colorless. Most diamonds used for jewelry are in the "near colorless" and "slightly - very slightly included" ranges. This is completely fine because you cannot see slight tints of color or flaws with the naked eye. What about looking for a 2.9 carat diamond? Usually, we recommend that if you're shopping for a 1-carat diamond, you can buy a 0.9 carat diamond to save a lot of money. But this isn't the case with 3 carat diamonds. You won't save much (if any at all) by trying to buy a 2.9 carat diamond. A lot of people are searching for 2.9 carat diamonds, and this raises the prices to be on par with full 3-carat diamonds. For a more detailed pricing list, we put together the following chart. 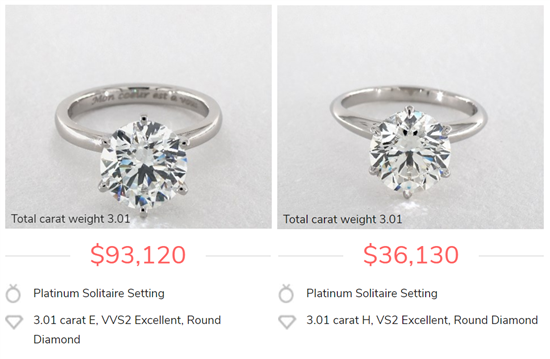 This chart shows the price ranges of a 3-carat, ideal cut, round diamond. The shape of the diamond matters, too. Round, brilliant diamonds are always the priciest. 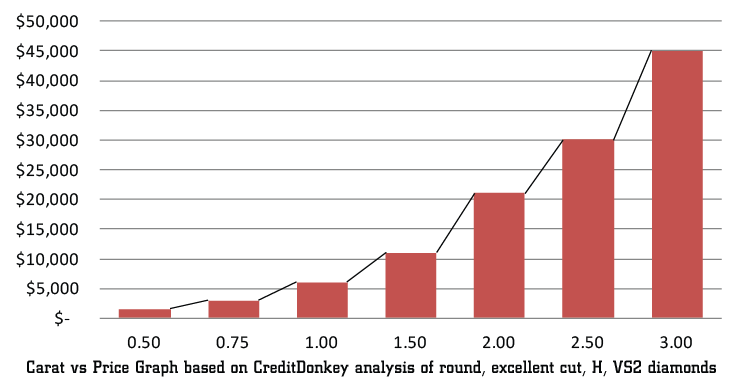 Fancy shapes can cost as much as 40% less. Did you know? About 50% of the rough is lost when cutting a diamond. It is estimated that about a 3-carat rough is needed to make an ideal-cut, 1-carat round diamond. Just imagine how large the rough needs to be to be cut into a perfect 3-carat diamond. Here's the price chart for fancy shaped diamonds. Considering a fancy cut diamond? They can cost as much as 40% less than a round diamond. Oval, asscher, and marquise cuts are pricier, but they are still as much as 15% less than a round diamond. Emerald and cushion cuts tend to be the least inexpensive. 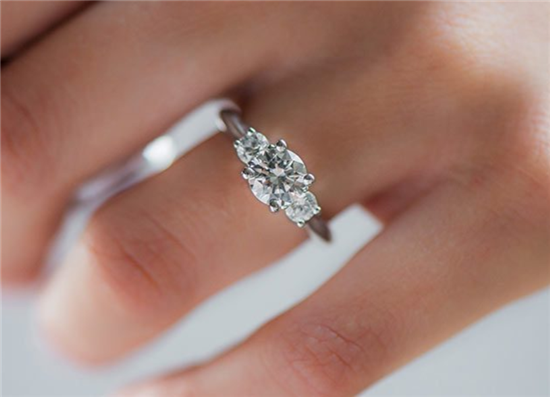 This may help you afford a 3-carat diamond on a smaller budget. Related: Diamond Shapes: Which Is Best for Your Ring? Larger diamonds reveal tints of color more easily. But it doesn't mean you need to splurge for a colorless diamond. If you prefer an icy white look to your jewelry, we recommend that you don't go below an H.
If you don't mind a warmer look or plan to set the diamond in a yellow gold band, then a J or K could look beautiful. Below is a H diamond set in platinum and a K diamond set in yellow gold. You can see that the warmer toned diamond looks great in a yellow gold band (and costs a lot less). Larger diamonds also show more flaws as their facets are larger. So, it becomes even more important to make sure that it's eye-clean. 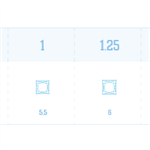 Usually, we recommend VS1 clarity to be on the safe side if you're buying from an online store without photos. But in reality, you can go down to VS2 if you are able to see actual photos/videos of the diamond to verify that it's eye-clean. For emerald and asscher cut diamonds, we don't recommend going below VS1. These step cut diamonds have a large open table that reveals all flaws. So we suggest upgrading the clarity. If you're shopping online for a 3-carat diamond (which can save you a lot), make sure you shop with a retailer that offers images of the actual diamond. James Allen offers HD 360-degree videos of every diamond in its collection. You can spin it around to see if you see any flaws. Round, princess, and cushion: Go for a color of H and clarity of VS2 for an eye-clean diamond that appears white. If your budget is a bit smaller, it's okay to go down to color I. Oval, pear, and marquise: These shapes have elongated ends, which trap more color. We recommend you go up to G in color. Emerald and asscher: These step-cuts have a large window straight into the depth of the diamond. Any flaws or color are more easily seen. We recommend you go up to clarity of VS1 and color G.
Yellow gold or rose gold band: You can afford to go for a warmer toned diamond to complement the band. You can go down to a K in color. In other words, do not sacrifice cut just to meet this 3-carat mark. For a rock this large, the last thing you want is one that doesn't sparkle. Request to see Idealscope and/or ASET images of the diamonds. This is the only way to be sure of the light performance of the diamond. 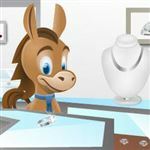 Whiteflash provides Idealscope images for all their in-house diamonds, and James Allen will provide up to three upon request. Lab certification: Make sure the diamond is GIA or AGS certified. Both laboratories have high consistent standards. While GIA and AGS certified diamonds are more expensive, this is an area you should not compromise on. To truly get the best deal on a 3-carat diamond, we recommend that you shop online. 3-carat diamonds are very rare. We can pretty much guarantee that your local jeweler will not have a ton in their collection. You may be stuck with just one or two choices, and neither may be within your budget or preferred specs. On the other hand, online stores have a much bigger selection. You'll have so many more options to choose from, so you can pick one with the characteristics you want. For example, currently on James Allen, there are over 200 ideal cut 3-carat round diamonds with color H+ and clarity VS2+. Our favorite online store is James Allen. They have a sizeable selection of 3-carat diamonds at all price ranges, specs, and shapes. The best part is their 360-degree HD videos for every diamond in their collection. You can spin them around to pick the one that appears eye-clean. Ok so maybe you wanted to get your sweetie the large rock of her dreams, but realized it's not quite financially feasible. Here are some suggestions to make a large diamond more affordable. Consider a lab created diamond. Lab created diamonds are identical to the ones mined from the Earth - just that the diamond creation process is sped up in a controlled lab environment. Besides being more eco-friendly, lab diamonds can cost as much as 35% less. Use a halo setting. The halo setting is best for making a splash with less money. It has a ring of small diamonds around the center stone, so from far away, it looks like one big diamond. A halo can add 2mm width to the overall diameter, so this means that a 1.5-carat diamond with a halo can have the same surface area as a 3-carat diamond. Compared to the $30k+ cost of a 3-carat diamond, a 1.5-carat diamond costs around $10k. 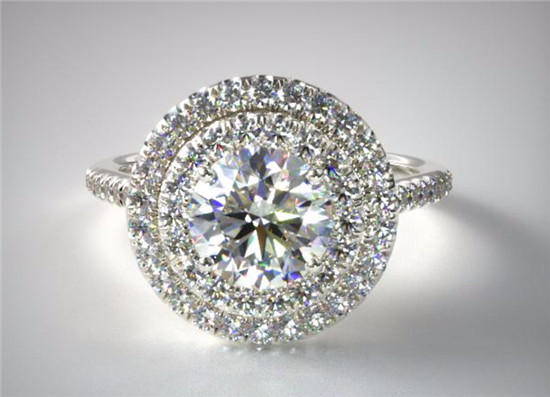 If your budget is even smaller, you can do a double halo, like the ring from James Allen below. This adds even more width. You can now go down to just a 1-carat diamond. A 1-carat diamond will cost around $5,000 - $6,000 and then add in $2,100 for this ring. And you can get a large looking ring on a small budget. Warning: Before you go this route, make sure your girl will appreciate this style. Make sure she's the type of girl who loves showing off flashy jewelry, as some girls may think this is too over the top. Go for a cluster ring. A bunch of smaller diamonds is a lot cheaper than one single large diamond. A cluster setting is when a bunch of small diamonds are placed together to give the appearance of one diamond. This style looks especially good with vintage designs. Look into three stone rings. Certain three stone designs also give a ring major bling. You can choose a setting that comes to total of 3 carats. For example, you can get a 1.5-carat center, with two 0.75-carat diamonds on either side. You can even get a three stone design with a halo around it, which means you can do a even smaller center. The three stones represent the past, present, and future of the relationship. This setting is good for the sentimental girl. We hope this guide gave you an idea of what you can expect to pay for a 3-carat diamond. Before you start shopping, make sure you understand how diamonds are priced. This way, you don't overpay for features that you cannot even see. Our beginner's guide to best value explains more about what to look for and what you can "go cheap" on. The diamond shape makes a huge impact on how large the diamond appears. 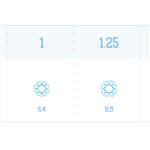 Our diamond size charts help you visualize the difference between shapes.